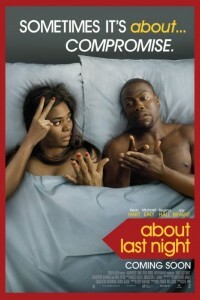 About Last Night 2014 features an all-black cast, which closely follows new love for two couples as they journey from the bar to the bedroom and are eventually put to the test in the real world. While comedian Kevin Hart is undoubtedly funny, and this generation’s Chris Rock or Chris Tucker, he is hardly believable as a ladies’ man being just over the height of midget, 5′ 2″. Sixty Second Movie Review - ‘Death at a Funeral'.